I will personally develop a comprehensive contest prep nutrition and training program to bring your best possible physique to the stage. Each contest prep program is designed specifically for each client based on their goals, daily schedule, training and diet history, available equipment, and other individual characteristics. Whether you are training for your first show, or competing at the Pro level, I will use my more than 23 years of contest prep experience and extensive knowledge of sports nutrition, supplement science, and stage presentation to help you bring your best ever physique to the stage. 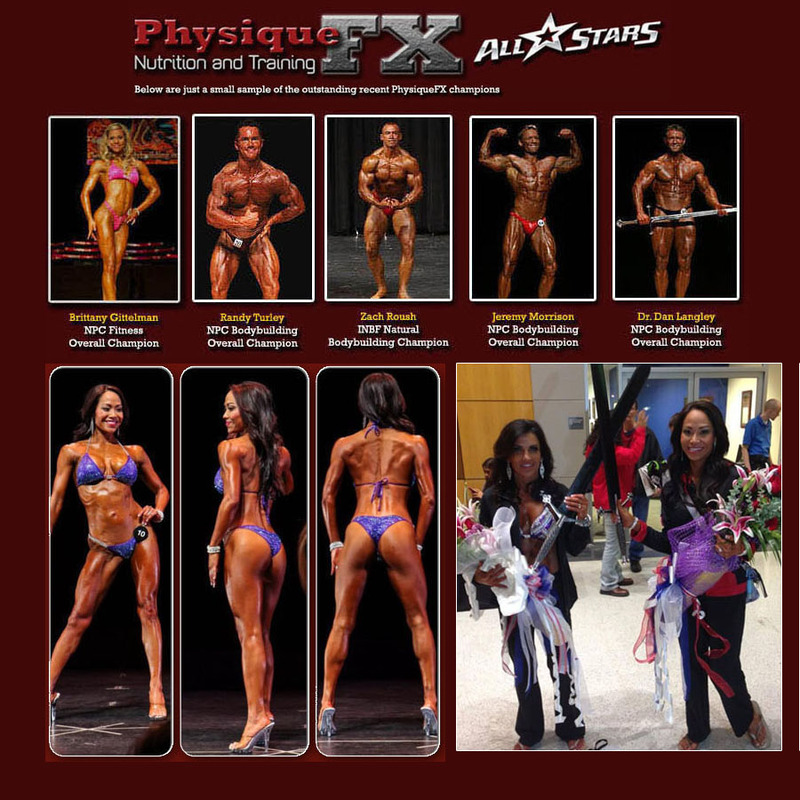 I offer both Online and In Person contest preparation packages. Both my online and in person packages include personalized nutrition and training programs designed specifically for each client. My In Person packages include up to 16 In Person Posing and Walking Practices to perfect your stage presentation for no additional charge ( $550 Value ). For my online clients, I have developed a system to perfect your posing through digital camera photos and video and this is included for my online clients for no additional charge. 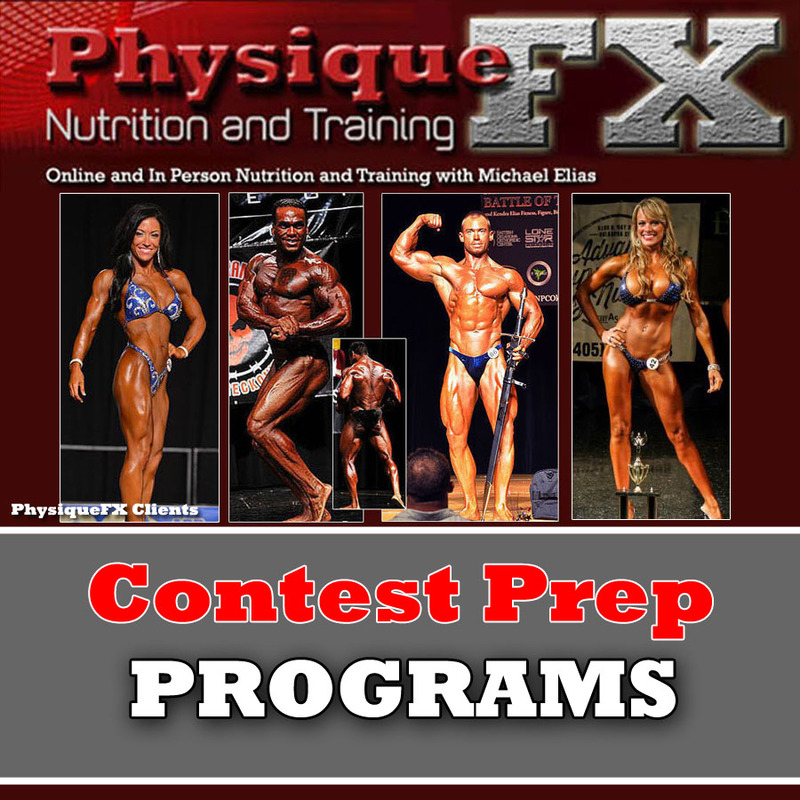 Detailed Contest Prep nutrition program to take you from off season form all the way to the stage. Your personalized plan will be designed based on your schedule, training and diet history, your personal metabolic calculations, and the contest condition required for your division and organization. Contest Prep Cardio and Weight Training routine designed to bring you in ripped and ready. Your personalized plan will be based on your schedule, training history, and available equipment. The crucial final week of prep, including carb depletion and loading , dropping water, contest color, and show day instructions will be provided to you so that there is no guess work about what to do during the final week. The In Person Contest Prep package includes up to 16 In person posing practice sessions where I will teach you the proper way to perform all the mandatory poses for your division, and teach you how to walk and stand on stage. Don't let your hard work go to waste! Presentation is a huge component to success on stage. Make sure you are ready to display your physique in the best way possible! I have developed a system to fine tune posing, even for My online clients. Through a process of using digital camera photos and video, as well as Skype or Facetime where available, I can help you perfect your posing and presentation entirely online. Michael has had extensive experience working in the supplement industry and an in depth knowledge of modern sports supplementation. He will design and recommend a supplement plan based on your specific needs and available budget to help acheive your best possible condition. No specific supplements are required for the contest prep program and the use of any and all supplements is entirely up to each client. I have more than 2 decades experience coaching athletes for both Natural and Open competition and I am an expert in the supplementation protocols for both natural and open athletes. I will update and revise your Diet and Training program as you approach your contest to keep you progressing toward your best possible condition. There is never any additional cost for additions or revisions to the elements of your program listed above. One price covers everything! Unlimited email support is also included during your contest prep. You may send any questions you have and I will answer them for no additional charge. There are never any additional charges for support or consultation during your program. Choosing the right division to compete in - ( Bodybuilding vs. Figure vs. Bikini ) etc. Any other questions you have about competing! Don't make rookie mistakes! Go into your show knowing that you are prepared and ready to take the stage and be your best! Please use this link to contact me if you have any questions: Contact Me! I will be happy to answer any questions you have, and look forward to the opportunity to help you reach your health and fitness goals.